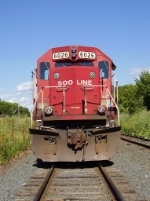 Album Info: SOO Line and Canadian Pacific units throughout the Twin Cities. Description: 2 AC44's working hard with a grain train (or is it potash?) roll into the Shoreham loop. Description: Long time no see! The same two i saw last week make a return. This time i got a much more interesting shot. 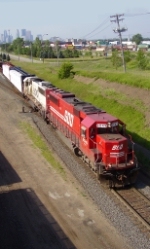 Description: Two action red units, both from the SD40-2 lines, come into Northeast MPLS. Description: The Grove switch job has a nice GP38-2 in the lead, with only 2 cars. Description: SOO 6053 leads a rather small manifest through Camden. In the Afternoon, this shot would have been even better. Description: A pair of SD40-2s cruise past on the Foley Wye. After this shot was taken, they took the Shoreham loop and went straight back to Humboldt. Description: Another AC44, nothing special. Description: SOO Line 4442, a veteran, but behind ex SOO 2555, Its still an infant. Description: A SOO SD60M idles on the Shoreham lead. Looks pretty rough, a window covered with Duct tape and the back has a nice size dent. 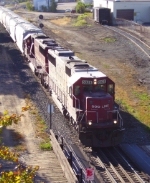 Description: A Dual Flag painted SD40-2, albeit missing some nose ornaments, sits with an action red SD40-2 and a SOO SD60M. Description: After leaving Humboldt to get set up for 290, we found 2 SD60s sitting at Camden waiting for a light. Description: An AC44 leads 2 UP units across the river. My first sighting of a UP SD70ACe! Description: A rather dirty ACe sits in the middle of CP 290. 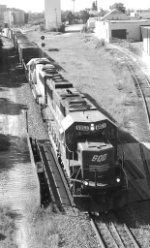 Description: A set of SD60s rumble across the river on their way to Humboldt. Ive seen the 6035 three times, and this is my first shot of it! Description: SOO 6035 idles as the 1447 rolls up and down performing switching duties. Description: One of 2 bandits spotted in Saint Paul on this lovely saturday. Great to see these ancient colors. Description: Still in the old "swoosh" scheme, 4601 idles with another GP40, that one in Milwaukee Road colors still. Description: The odd looking 4620 (the rather high overhang with the numberboards) enters Pigs Eye with the 4600 trailing. Description: One of the few bandits left, although this one looks much worse than its siblings, leads a lite power move into the yard. So happy to see this! Description: The Ford hauler sits close to the Robert St. Lift bridge. Sadly i couldnt get on the "sunny side". Description: SOO 4428 rests outside the roundhouse. Description: The 8556 adds some air to the train and shortly will have a new crew to take this train to Chicago. Description: One from the first order throttles up for Chicago. Description: With its midsection bearing its old owner, the SOO 1548 scoots over the historic Shoreham bridge. You can notice SOO LINE printed on the bridge, one in the old style and one in the new style. Description: The last new purchase the SOO Line made, the 6062. Description: A pretty chipped looking CP SD40-2 comes into the Foley Wye with the SOO 6057 behind him. A nice string of EJ&E gons makeup the front of the train. Description: The ever so popular 6027 leads the SOO 6044 towards Camden. Description: The skyline in the backround looks over the 8729 as it departs Shoreham for Humboldt. Description: The ES44 is only crawling on its trip from Humboldt. This would definately qualify as breaking it in! Description: A consist to remember. This is actually the road power for this train, and what a sound it made! Description: With a pretty nice sized train, a pair of geeps, both of SOO heritage, cross the river. Soon, the GP9 will blanket the surrounding areas with grey smoke. Description: Showing what its made of, the 4401 and the 8263 throttle up on the Foley Wye. Description: A pair of SOO geeps sit beside the fueling racks. Description: A pair of Candy Apple SOO units idle next to the infant CP ES44. Description: A red barn idles with a pair of CP SD40-2s at Pigs Eye. Description: Units idle under the racks at Saint Paul. 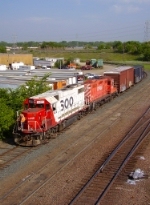 Description: A single SD60 waits for a pair of multimark SD40-2s to clear the main. Description: 6050 shown here with a short manifest is waiting in the hole for an eastbounder. Description: A manifest comes through the wye with a snow ridden GEVO leading the 5629.